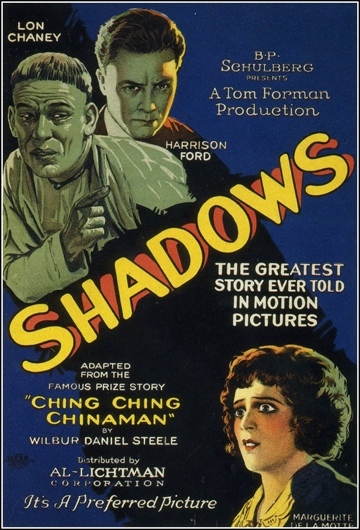 Tag line: "The Greatest Story Ever Told in Motion Pictures"
Shadows is a difficult film to review. On the one hand, it features the great Lon Chaney, who delivers yet another impressive performance. Unfortunately, the character he’s portraying, a Chinese man named Yen Sin, is, in many ways, a stereotype. If you accept the movie as a product of its time, there’s a good chance you’ll come away impressed, if not with the story itself (which is a tad slow, and too melodramatic), then definitely with Chaney (his Yen Sin is one of the most sympathetic individuals in the movie, not to mention the wisest). Just be prepared to cringe at some of the title cards whenever his character “speaks”. In the fishing village of Urkey, situated on the coast of Maine, there lives a kind, sensitive young woman named Sympathy Gibbs (Marguerite De La Motte), whose husband Daniel (Walter Long) mistreats her horribly. The town’s most prestigious citizen, Nate Snow (John St. Polis), is secretly in love with Sympathy, and despises the way the brutish Daniel takes out his frustrations on her. One night, shortly after Daniel and his fellow fishermen have headed out to sea, a fierce storm rolls in, and when the sun comes up the next morning, the good people of Urkey, including Sympathy, are met with the devastating news that their loved ones did not survive the ordeal. In fact, only a handful of men made their way back to land, one of whom was Chinese immigrant Yen Sin (Chaney), whose ship was destroyed in the storm. Despite being tormented by the locals for his “heathen” beliefs, Yen Sin settles down in Urkey, and quickly gets a job cleaning clothes. Seizing the opportunity, Nate Snow tries to cozy up to the recently-widowed Sympathy, only to be upstaged by new minister John Malden (Harrison Ford, though obviously not ‘that’ Harrison Ford). Making it his personal mission to convert Yen Sin to Christianity, Malden also falls head over heels in love with Sympathy, and before long the two are married. Their wedded bliss is cut short, however, when Malden learns that Daniel Gibbs may not be dead after all! 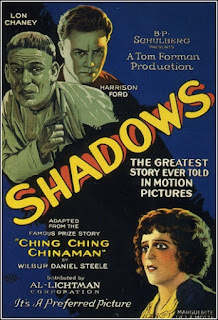 An occasionally sappy, overly dramatic film with pacing issues, Shadows also featured the incomparable Lon Chaney, who (as he’d eventually do in both The Phantom of the Opera and The Hunchback of Notre Dame) disappears behind layers of make-up to fully embody the part of the elderly Yen Sin. Alas, Yen Sin is also a stereotypical Asian, who washes clothes for a living and mispronounces words (it took me a while to realize that “flen’ was his way of saying “friend”). It’s an unfortunate characterization, especially when you consider how strong Chaney’s performance is otherwise (from his mannerisms down to the contemplative look in his eye). As he’d do many times throughout his career, Lon Chaney made Shadows a memorable film, though in this case it was for both the right and wrong reasons.